Frittering my morning away - Stop staring and start sewing! Yesterday I picked up the 80 pounds of apples (yes 80 pounds!) that I ordered from the produce co-op I'm in. So guess what we'll be eating for the next 2 weeks: apple pie, apple cobbler, apple gumbo, apple burgers, pan fried apple, deep fried apple, stir-fried apple, there's apple sandwich, apple creole, apple ka-bobs......you catch my drift. 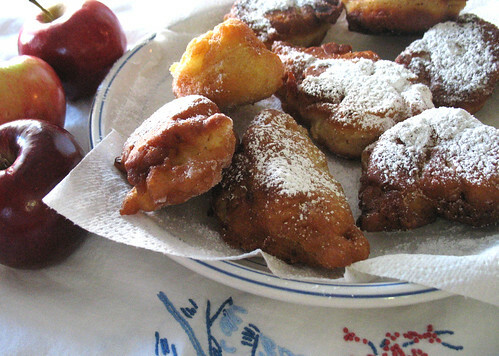 So this morning we started off with apple fritters. This were quick and easy and didn't require any fancy ingredients. I did add some orange zest and juice from half an orange to give it a little zip but I think I might try lemon next time to make it zippier. And a standing O from one of the judges (he'll eat anything that's not nailed down so I wouldn't take his word on it)! 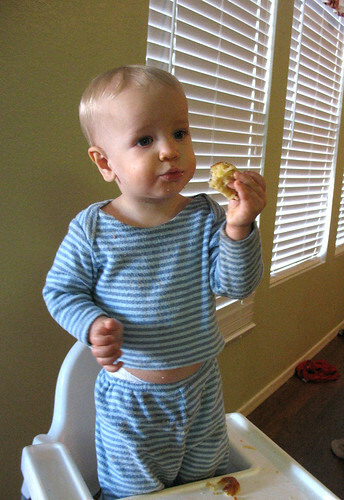 These are my favorite pajamas of his. I used this pattern which is fast and easy and I can fit the shirt over his big ol' head (I've adjusted the pattern to make it longer next time). This fabric is a super snuggly brushed cotton knit that I found at this wonderful store while on vacation (for only 5.00 a yard! eek!). Anyway, I'm working on some sweet velour sleep sacs made from the same pattern and dang! they're turning out cute! Ahhh....apples and snuggly jammies....I love fall!